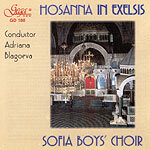 The works on this compact disc were composed by the matters of Bulgarian and Russian church music. Most of the pieces feature Dobri Hristov and Peter Dinev, experienced connoisseurs and champions of the popularisation of Bulgarian Orthodox Music. The Sofia Boys' Choir, conducted by Adriana Blagoeva is performing. The choir has a lot of awards from international contests and its greatest merit is its outstanding vocal quality, its coherence and the profound interpretations. 4 Vozlyublyu, tya, gospodi 0'57"
7 Da ispravitsya molitva moya 1'12"
14 Sei narechenii I svyatii den 2'53"
16 Vo tsarstvii tvoem 1'32"
19 Hvalite gospoda s nebes 1'22"
21 Vo Tsarstvii tvoem 1'45"
22 Elitsi vo Hrista 2'20"